What if everything you thought you knew about your life was a lie? Lauren is adopted and eager to know more about her mysterious past. But when she discovers she may have been snatched from her family as a baby, her whole life suddenly feels like a sham. Why will no one answer her questions? How can she find her biological parents? And could her adoptive parents really have been responsible for kidnapping her? Running away from her family to seek out the truth, Lauren's journey takes her deeper and deeper into danger as she realises that someone wants to stop her uncovering what really happened when she was a baby... at any cost... A nail-biting YA thriller from the bestselling author of Close My Eyes 10 years on from it's first publication, Girl Missing has sold over 150,000 copies in the UK alone. This new edition of the bestseller includes exclusive extra content from Sophie and is a must for fans and readers that are yet to discover this modern classic. 'Page-turning' The Independent 'Will have you gripped for hours' Sunday Express 'Please read this book: it is brilliant! 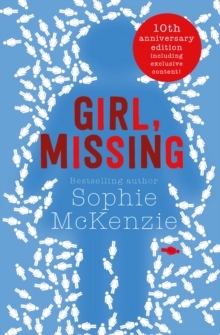 ; The Guardian 'Whenever I hear the phrase YA thriller I only ever think of one name - and that's Sophie Mckenzie.